Scientists have found evidence of material that shows Earth may have collided with another object billions of years ago. They found that an unexplained isotopic ratio from deep in the Earth's mantle may come from material that existed prior to the collision. This led the scientists to believe that they have identified a sign that only part of the Earth melted, and that an ancient part still exists within the Earth's mantle. The Great Impact Theory hypothesized that the Earth collided with a heavily massed object which resulted in the formation of the moon. The object, about the same mass as Mars, collided with the Earth around 4.5 billion years ago and the resulting debris coalesced and formed the moon. This planetary object was given the name Theia. A group of scientists believe that a previously unexplained isotopic ratio from deep within the Earth may be a signal from material from the time before the Earth collided with another planet-sized body, leading to the creation of the Moon. This may represent the echoes of the ancient Earth, which existed prior to the proposed collision 4.5 billion years ago. This work is being presented at the Goldschmidt conference in Sacramento, California. The currently favoured theory says that the Moon was formed 4.5 billion years ago, when the Earth collided with a Mars-sized mass, which has been given the name "Theia". 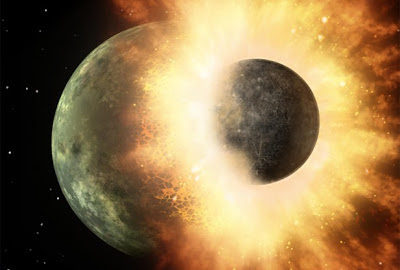 According to this theory, the heat generated by the collision would have caused the whole planet to melt, before some of the debris cooled and spun off to create the Moon. Now however, a group of scientists from Harvard University believe that they have identified a sign that only part of the Earth melted, and that an ancient part still exists within the Earth's mantle. "The energy released by the impact between the Earth and Theia would have been huge, certainly enough to melt the whole planet. But we believe that the impact energy was not evenly distributed throughout the ancient Earth. This means that a major part of the impacted hemisphere would probably have been completely vaporised, but the opposite hemisphere would have been partly shielded, and would not have undergone complete melting". The team has analysed the ratios of noble gas isotopes from deep within the Earth's mantle, and has compared these results to isotope ratios closer to the surface. The found that 3He to 22Ne ratio from the shallow mantle is significantly higher than the equivalent ratio in the deep mantle. Professor Mukhopadhyay commented, "This implies that the last giant impact did not completely mix the mantle and there was not a whole mantle magma ocean". Additional evidence comes from analysis of the 129-Xenon to 130-Xenon ratio. It is known that material brought to the surface from the deep mantle (via mantle plumes) has a lower ratio than that normally found nearer the surface, for example in the basalts from mid-ocean ridges. Since 129-Xenon is produced by radioactive decay of 129-Iodine, these xenon isotopes put a time stamp on the formation age of the ancient parcel of mantle to within the first 100 million years of Earth's history. Professor Mukhopadhyay continued "The geochemistry indicates that there are differences between the noble gas isotope ratios in different parts of the Earth, and these need to be explained. The idea that a very disruptive collision of the Earth with another planet-sized body, the biggest event in Earth's geological history, did not completely melt and homogenize the Earth challenges some of our notions on planet formation and the energetics of giant impacts. If the theory is proven correct, then we may be seeing echoes of the ancient Earth, from a time before the collision". "This exciting result is adding to the observational evidence that important aspects of Earth's composition were established during the violent birth of the planet and is providing a new look at the physical processes by which this can occur".